thinwall is half of molo’s new benchwall + thinwall modular system. 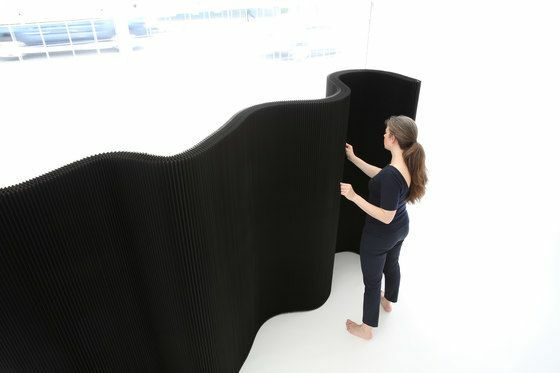 A flexible, lightweight partition 6’ in height, thinwall is similar in form to softwall (based on an expandable honeycomb form), but with a thinner profile (measuring only 3.5” (8.75cm) in width) that can create nuanced ribbon-like shapes. From an initial compressed form only a few inches long, thinwall expands by means of flexible honeycomb to a length of 15’ (4.5m). thinwall differentiates itself from other partitions through its versatility. Versus typical partitions that are relatively static, thinwall is incredibly mobile and can be fluidly shaped to fit into any space. The combination of this mobility with a narrow profile gives thinwall additional functionality as custom wrapping for millwork, doors for closet shelving, window coverings, or an acoustic treatment for fixed walls and ceilings. The new thinwall design is a beautiful addition to the subtle visual language of molo’s soft collection. thinwall has been designed to connect together perfectly with the back of benchwall via magnetic panels integrated into each end of the designs. The designs can be combined and recombined with one another to create continuous environments that offer flexibility, privacy, and acoustic solutions for not only those within the partitioned areas, but also those around the exterior of these spaces. black paper thinwall is made from 50% recycled, post-consumer pulp, dyed velvety black with bamboo charcoal ink. thinwall is also available in natural brown and indigo blue colours, and a translucent white textile made from 100% recyclable polyethylene. thinwall belongs to molo’s innovative, award winning soft collection of expandable/compressible furniture, lighting, and space partitions created from flexible paper and textile honeycomb structures. molo, based in Vancouver, Canada, is a collaborative design and production studio led by Stephanie Forsythe (B.EDS, M.ARCH) and Todd MacAllen (B.FA, B.EDS, M.ARCH).